Organic is a dirty word in Paris. Not that they are against organic produce as we know it. No, “organic” brings to mind roadkill and other rotting objects. Instead, the French use the term Biologique. BIOart is a restaurant that specializes in using only biologique ingredients in their cuisine. I must admit I’ve passed this restaurant many, many times while heading home. It’s a bit cold on the outside, but supposedly very nice and comforting on the inside; where it really matters. This was the first certified organic restaurant in France. The food is also locally produced and dishes are seasonal. You’ll find a wide variety of dishes for vegetarians and vegans. It’s a bit pricey, so save this for one of those special dinners on your vacation. A new addition to the city’s booming 13th Arrondissement, BioArt **** (dinner for two $100) serves an all-organic menu—risotto topped with shaved truffles; a terrine of diver scallops—in a design-forward space overlooking the Seine. I have not visited this restaurant yet, so I cannot give a review. Exki is one of the many new healthy fast-food restaurants that have opened in Paris recently. There are several locations in the city to get a quick salad, juice, and meal for lunch. Nous sélectionnons pour vous les meilleurs ingrédients saisonniers. Nous refusons l’usage de tout additif. Certains de nos produits sont labellisés BIO. Par exemple le pain, confectionné et cuit artisanalement sur pierre, sans aucun “améliorant” artificiel. Pour garantir sa fraîcheur, nous terminons sa cuisson, chaque matin, dans nos restaurants. Eating in Paris involves many choices. The first of which is “where should I go this time?” This is especially true when you have great restaurants to choose from. 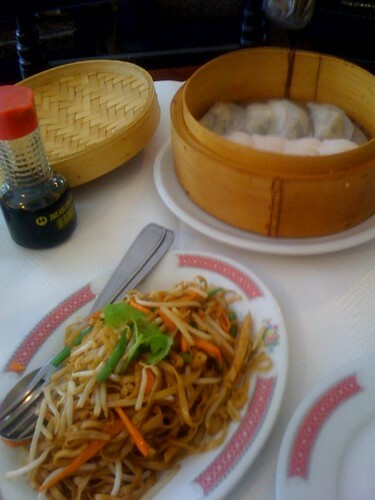 For instance, where do you go when you want some good, vegetarian Chinese food? Tien Hiang is a great Asian restaurant in the 11th arrindissement. It is popular, affordable, and has a huge selection of vegan and vegetarian meals. But what if you are on the Left Bank and prefer something closer to home? The Green Garden is a great Chinese restaurant near Olympiades in the 13th arrindissement. It’s a family style restaurant with a small market with an amazing collection of faux meats. I’ve never seen faux prawn or a complete faux chicken with wings and legs. It is a small restaurant that can fill up rather quickly. The menu is extensive and the food is affordable and very tasty. I had the steamed dumpling menu for 10.50 Euros. This included 8 dumplings and a plate of fried noodles. I new I’d be returning when I realized the dumplings were gone and I wanted more. The fried noodles also had some extremely fresh green beans, tofu, and sprouts. Several groups arrived in the restaurant and began ordering family style. The large variety of their menu would make this a great idea. They are very proud of their menu’s lack of eggs, genetically modified ingredients, alcohol, and MSG. There are plenty of Vegan choices on their menu and many of the dishes can be modified upon request. Where do you go for vegetarian Chinese food? Tien Hiang or Green Garden are both a bit difficult to find for the average tourist. Your decision may be based on location. Green Garden is near the Porte D’Ivry metro station, which is also the end of the #3 Tramway. Green Garden is also more spacious and elegant than Tien Hiang. Tien Hiang is closer to Pere Lechaise and is a good post-cemetery stop. Chez Lili et Marcel is the sister restaurant to Chez Prosper and Cafe Panis. 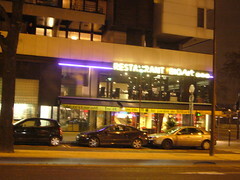 Both are popular restaurants that serve classic French cuisine. The portions are large, the staff is friendly, and the value is great. Chez Lili et Marcel is located next to Metro: Quai de la Gare, a stone’s throw to the Seine. It’s a very convenient location in the 13th arrindissemont. Unlike Chez Prosper, Lili et Marcel is quiet, comfortable, and you’ll have plenty of time to enjoy your meal. To quote Henry Ford: you have a great choice of meals. There’s the salad Marceillaise and the salad Marceillaise. Yes, there’s really only one vegetarian dish and no vegan dishes. However, this salad is wonderful. It features a layer of greens, tomatoes and cucumbers. 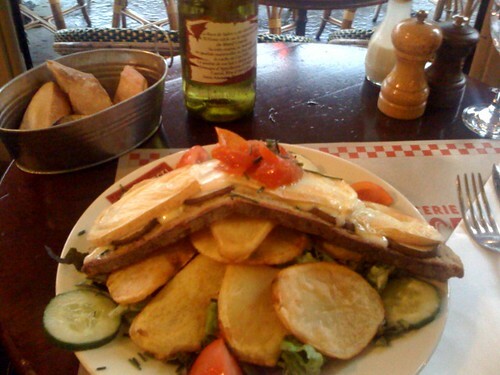 On top is a layer of sauteed potatoes and then a tartine with thinly sliced pears, honey, and cheese. It’s a hearty meal for about 12 euros. I visit Lili et Marcel often. It’s a great place to meet friends when you actually want to hear each other. Parking is fairly easy to find at night. It’s great for your meat eating friends, but not so great for your vegan friends. I recently visited Lili et Marcel with big hopes for my beloved salad. Alas, it was no longer on the menu. They had another vegetarian salad that included a vegetable soup. It was ok, but not inspiring as the salad that filled me on so many nights. I’m reducing the rating for now. Paris is full of surprises. There are little gems around every corner. The Parisian Sweet Bar in the 12th arrondissement is an example. You’ll also find small museums, art galleries, pocket sized parks, and chunks of ancient history. This leads me to Gout Zen. I stumbled across this restaurant while leaving an unfamiliar metro exit (Bibliotheque). The street is subterranean, with car-filled bridges above, towering buildings, old stone steps to new areas, and a green beacon of light and energy. 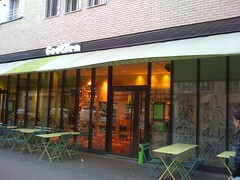 Gout Zen is a restaurant, cafe, and organic market all wrapped into one. It reminds me of the No Stress Cafe, near Place de Pigalle. There’s more to just eating at Gout Zen. You can rent a heated wrap for your tired shoulders at 1 Euro for 15 minutes, use free wireless, and purchase some organic food and supplies. It’s a friendly cafe that is bright and comfortable. 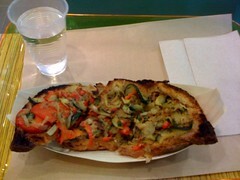 I had the vegetable bruschetta at 6 euros. Although a tad salty, I enjoyed the snack and used the wireless until my laptop battery died. The cafe also features some interesting vegan alternatives. I’m dying to try the faux steak au poivre. 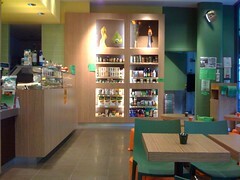 The fixed price menus range from 8 to 15 euros and include a variety of vegetarian and vegan options. Finding Gout Zen is a bit tricky. Take the Rue Du Chevaleret exit if you are coming from the metro line 14 or RER C. You can also reach it by climbing down the steps on Rue de Tolbiac, Rue Thomas Mann, and Rue des Grands Moulins. I’d suggest using the Rue de Tolbiac steps.